Welcome to the home of The Original Santa Fe & Canyon Road Walking Map. We’d like to welcome you to Santa Fe! 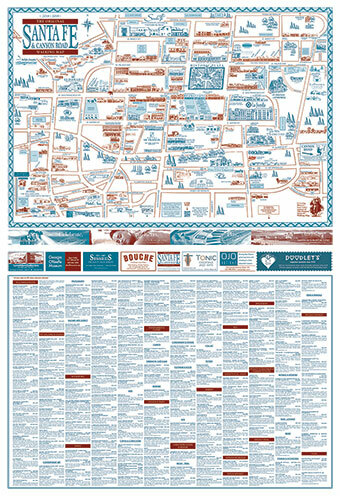 As you stroll our city streets and peruse all that the City Different has to offer, we invite you to use our map as your guide. Santa Fe has long been a place of magic and adventure and the Santa Fe Walking Map has helped visitors find their favorite locations for over 40 years. Let us help you discover Santa Fe! SGA can help you buy or sell your business. Request a consultation from New Mexico’s premier business brokerage, serving Santa Fe since 1983. *Participating 2019-2020 Map Businesses receive free consultations. A craft cocktail lounge, focusing on jazz and high-quality tavern bites. Set in an intimate 1920’s inspired room, Tonic offers a charming getaway unlike anything else in Santa Fe. 21+ only. Authentic southwestern style vacation rentals and timeshares in historic south capital. We have furnished one, two, and three bedroom condos. Your home away from home in Santa Fe. Reflecting authentic Territorial Style architecture, 182 guestrooms draw inspiration from New Mexico Spanish missions. Featuring spacious light-filled sitting areas and oversized bathrooms. Many rooms feature fireplaces, balconies, & jetted tubs. The El Rey is a historic landmark hotel renowned for its adobe architecture and classic Route 66 motor court appeal. The El Rey provides guests’ an authentic experience as to the essence of Santa Fe with Breakfast, Pool, Hot Tubs. Located just two blocks from the historic Plaza, this AAA Four-Diamond-rated hotel offers well-appointed rooms, full service amenities and valet parking. Recently named #2 in Condé Nast Traveler’s 2017 Readers’ Choice Awards for Top Hotels in the Southwest and West. An enchanting B&B offering a true taste of the southwest behind adobe walls. Just 3 blocks from the Plaza. Full breakfasts plus complementary wine and cheese hour on the patio. Hilton Santa Fe Buffalo Thunder Resort & Casino showcases a pair of luxurious Hilton Hotels: The Hilton Santa Fe Buffalo Thunder and the Homewood Suites by Hilton. Surrounded by beautiful views and luxurious accommodations, you will experience the true southwest. Steps from the Historic Plaza and Railyard District. Southwest ambiance at its finest! World class accommodations and amenities. The Ortiz Bar and Restaurant serving New Mexican influenced cuisine and refreshing hand crafted cocktails. Our boutique hotel, one block from the Plaza, is located in the heart of world-class shops, museums, restaurants and nightlife. Every spacious guest room contains custom local artwork. Enjoy Estevan’s Restaurante and cocktails at Low & Slow Lowrider Bar. Located one block from Santa Fe’s Plaza, the historic and enchanting oldest hotel in Santa Fe, invites you to savor the culture of New Mexico. Experience the best wines and cocktails at Secreto and Gruet Tasting Room. An Exquisite hotel that celebrates the authentic culture of New Mexico. Featuring an award-winning spa, casual fine dining as well as many unique onsite galleries and boutiques. Condé Nast Traveler Readers’ Choice Top 10 Hotels in the Southwest and West. Welcome to an amazing destination in the heart of The City Different. The Inn at Vanessie is a charming, comfortable, boutique Bed and Breakfast with distinctive room designs and 5 star amenities, all within walking distance of the plaza. An intimate and luxurious haven surrounded by tranquil courtyards with cooling fountains, balconies and fireplaces. Intimate rooms designed by Ira and Sylvia Seret of Seret & Sons with baths crowned with vivid tile mosaics reminiscent of Silk Road Palaces. A charming, intimate, inviting haven with traditional southwestern hospitality awaits you. Conveniently situated downtown on historic Paseo De Peralta, a short walk to the bus line. Our knowledgeable staff provides personalized service, homemade breakfasts, and afternoon tea daily. Qualifying Broker Melissa Prewitt Excited to be under new ownership and management! Specializing in vacation rentals, from casitas to multi-bedroom homes. 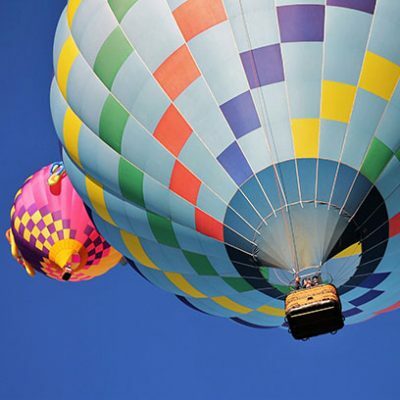 Be inspired by the splendor of New Mexico, near-by art galleries, and adventure in the Land of Enchantment. Historic, 4-Diamond hotel, featuring 180 guestrooms, including 15 luxury Terrace rooms and suites with private concierge. Dining in La Plazuela, live music in La Fiesta Lounge and seasonal Bell Tower. This historically plaqued 1886 frontier-style Victorian Inn, just three blocks from the Plaza, is the perfect embodiment of Santa Fe history. Guests love our quiet garden setting, delicious full breakfasts, and indulging in our award-winning Absolute Nirvana Spa. We offer a business center, free WiFi; Indoor pool & hot tub. Bring along your dog, we’re a pet friendly hotel. We offer the lowest price of any National chain. Outdoor pool, in room fridge, pets stay free. Located in the heart of downtown Santa Fe. This pet friendly hotel offers outdoor seasonal pool and fitness center, free WiFi, free hot breakfast. On site restaurant and bar. Award winning! 58 rooms with kiva fireplaces in an artful blend of southwestern architectural elements & handcrafted luxury: indigenous rugs, hand-woven fabrics & regional artwork. At Santa Fe Motel & Inn we offer the truly Southwest experience our well-appointed decor, comfortable beds and great atmosphere will make you feel what Santa Fe is all about, our heralded breakfast will be something you will love! A hidden destination for art collectors! Specializing in 20th century American art from the Taos Society of Artists, Taos Moderns, Los Cinco Pintores, Transcendental Painting Group, and the Stieglitz Circle. Featuring the work of internationally recognized self-taught fabric appliqué and embroidery artist, Chris Roberts-Antieau, often described as visionary, folk, outsider, and contemporary. Check website for upcoming events. Featuring unique impressionist paintings and sculpture of native New Mexican Barbara Meikle. An oasis of colorful joy! Other artists include Carla Spence, Robert Burt, Andrew Carson, Gilberto Romero, David Shanfeld. David Copher is a multi-media working artist in sculpture, painting and jewelry at his Santa Fe Gallery-Studio. You can see his work in collections and museums nationally and internationally. Recognized internationally for over 30 years for exquisite New Mexico pastel landscape paintings, Sara’s sizable body of work with Judaic themes includes The Women of the Bible series and book. Housed in the historic Bandelier House. Offering Naturalism, Contemporary, Western, Taos Society & Santa Fe Art Colony Art. Mon.-Sat. 10a.-5p. TV Personality, Heidi Loewen, offers a gallery of her award-winning sculpture, ceramic restoration & magical hands-on pottery classes. Create or commission your work of art with Heidi. Champagne & Chocolates! One block off the Plaza in the West Palace Avenue Arts District. Fine collection contemporary representational paintings, sculpture and fine jewelry. Featuring 40 exceptional emerging and established artists. A primary destination for collectors, with high quality fine art, specializing in traditional & contemporary sculpture. Exquisite lifesize figurative bronze sculptures by nationally recognized artists in the sculpture garden. Specializing in the works of The Taos Society of Artists, The Santa Fe Art Colony, classic Western, American impressionism and modernism. Come walk through our one-acre Sculpture Garden! Presenting historically significant, globally recognized, contemporary art in a spacious, naturally lit viewing environment with sculpture garden. Mon.-Sat. 10a.-5p. Significant modern American painting and sculpture in the Spiegelberg House, exclusively representing the estates of numerous important artists. Museum quality Spanish Colonial, Old Masters, Pre-Columbian, African, Oceanic, and Textile collections. Welcome to Scarlett’s – home of choice quality antiques & art for the discriminating collector. Bronze animal sculptures by acclaimed SAA artists D.D. Mason and Dan Chen. Fabulous fine folk art angels by Sylvia Martinez Johnson. Also featuring beautiful American paintings, vintage Sabino crystal, and unusuals, all in a warm, friendly atmosphere. All Authentic, No Reproductions. Featuring paintings and sculpture by local artists such as Yellowman, Doug Coffin, Rhett Lynch, Eric Tippeconic, and Cliff Fragua. See our entire collection of talented artists. First Friday Artwalk. Wiford Gallery is a fine art destination surrounded by a beautiful & spacious outdoor sculpture garden. We are honored to represent some of the finest artists in the world. Exhibiting Pre-Columbian objects, textiles and gold jewelry alongside heirloom Andean and Indonesian textiles. Specializing in ancient geometric and color field textiles. A gallery that encourages acceptance, tolerance, unity, and rebellion as a means of change. Our artists are cultivated with this theme in mind, creating a space that helps bring awareness through art. Dedicated to sharing artworks from the Carl & Marilynn Thoma Art Foundation, Art House is the only digital art collection open to the public in the Southwest. Thursday-Saturday, 10am-5pm. Free admission. 25 artists, – Oaxacan painter Leovigildo Martinez, muralist of Cafe Pasqual’s dining room. THE GALLERY for Mica Cookpots, Raku, Ceramics, Jewelry, Woodcarving, Photography, Rick Phelps Paper Mache. Follow Yellow Bricks next door to Cafe. Featuring works of owners Ernst Gruler and Blair Vaughn-Gruler plus other exceptional painters, sculptors, fine jewelry artists and fine art furniture. Contemporary, non-objective work focused on materiality. 530 & 532 Canyon Rd. Metaphorical & Magical Realism by Masters Vladimir Kush & Michael Parkes. Original Oils & Watercolors. Bronzes. Stone Lithographs. Glass. Exotic furniture & kaleidoscopes by 20 world-class visionary artists. Spacious gardens filled with kinetic sculpture by Mark White and bronzes by nationally known sculptors. Painters include Mark White, Marshall Noice, Matthew Higginbotham, Suzanne Donazetti, Andrée Hudson, and Ethan White. An established gallery on Gypsy Alley, showcasing strong contemporary work with emphasis on thoughtful exhibition design and promoting stimulating dialogue between our emerging, mid-career and important contemporary masters. Representing fine contemporary craft by museum caliber American & European artists. Collection includes art jewelry, wood, clay & textiles. “Soul-stirring” works in the heart of downtown’s Museum District. Gallery artists provide a “sensory experience of color and mood” through acrylic, oil, and pastelpaintings, as well as contemporary sculpture in stone, glass, steel & bronze. Contemporary American, European and Asian art. Established in 1991, featuring emerging and mid-career, museum-track artists. Inspire your life with art! Mon.-Sun. 10a-6p; Fri. 10a-7p. Internationally renowned photography bookstore housing thousands of photobooks, including signed, foreign, limited edition and out-of-print titles. Our project space showcases works of emerging and established photographers. Exciting, contemporary photography in an unusual, elegant architectural space. Representing work by leading national and international photographers including Nick Brandt, Julie Blackmon, Tom Chambers, Kate Breakey, Mitch Dobrowner, Maggie Taylor, among others. Blue Rain Gallery represents established artists of diverse backgrounds working in a variety of mediums. The gallery exhibits an inspiring collection of Contemporary, Western Heritage, and Native American Art. Contemporary American and European art. Specializing in Monochrome, Light and Space, Modernism and Color Field painting. Located in The Railyard Arts District. Mon.-Sat. 10a-5p. Provocative + Compelling Contemporary Art of International Acclaim. Featuring Lynn Boggess, Nicholas Herrera, Javier Marín, Louisa McElwain, Julie Speed, Kent Williams. Railyard Arts District Last Friday Art Walk. One of the oldest/ largest galleries in Santa Fe, offering a lively mix of contemporary and modernist painting, sculpture and glass. Abstract, realist, landscape paintings in a museum-like space. A contemporary art museum dedicated to presenting the art of our time by some of the most engaging, boundary-pushing, and influential artists working today. A local gem for over 35 years, The Ark is one of Santa Fe’s hidden treasures. Books, gifts, crystals & stones and ambiance! Santa Fe’s favorite place for used and out-of-print books and CDs. Huge selection, reasonable prices, knowledgeable staff. Come browse! Buy/sell/trade. Open seven days. 10a.-7p. 202 St. - at Water St.
407 W. San Francisco St. Literary selections designed to surprise, inspire, and satisfy. Generous and carefully curated selection of art, style, history, biography, literature, southwest art & architecture, new fiction and non-fiction. Boutique bookshop. First and limited editions, all eras, many signed. Western Americana, travel & exploration, history, sciences, poetry, fiction, antique bookends & more. Mon-Sat 11a-5:30p. Join us for inspired modern and contemporary French cuisine and wines from around the world. Prepared with seasonal ingredients sourced from local Farmer’s Market. Chef-owned for 20 years. Featuring fresh and inventive breakfast, lunch and dinner menus. Enjoy premium cocktails while you relax in a casual, hip setting. 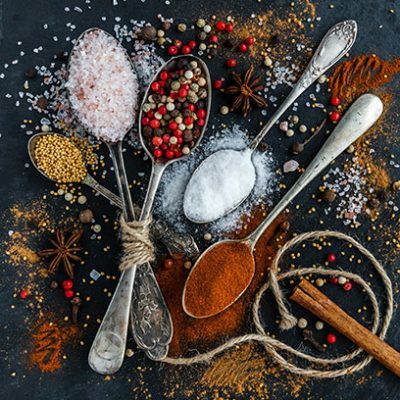 Old world techniques fused with modern, innovative recipes. Bar & Lounge features classic cocktails & Southwest inspired menu. Seasonal patio. Sandwiches, falafel, and salads. Our food is fresh, healthy, and organic. Dine in or take to the plaza. Vegetarian, vegan, and gluten-free options available. Modern French bistro cuisine. Extensive wine list. Onsite parking. Voted 10 Best French restaurants in the U.S.
Locals’ favorite hangout! Featuring inexpensive, organic, and locally sourced food served ’til 1:30am. Santa Fe’s longest bar, biggest craft beer and liquor selection, FREE live music, and every sports package! Choose from five fabulous restaurants: Turquoise Trail, The Red Sage, Iguana Café & Cantina, Painted Parrot Buffet or the Pueblo Deli! Café Pasqual’s serves Organic Cuisine drawn from the traditions of Mexico, New Mexico, Asia, and the Mediterranean. We are located in one of the oldest freestanding buildings in Santa Fe. The Compound Restaurant first opened in 1966 and this year celebrates 52 years of fine dining on Canyon Road with James Beard Award Winning Chef Mark Kiffin at the helm. Visitors & locals crave the Cowgirl’s handcrafted BBQ, regional American specialties and phenomenal Taproom. Lunch, dinner, weekend musical brunch. Nightly entertainment, patio dining, billiards and Best of Santa Fe catering! Santa Fe’s most celebrated restaurant. Modern southwestern cuisine masterfully prepared for an intimate dining experience. Our Famous outdoor “Rooftop Cantina” offers the finest authentic flavors of Mexico. Santa Fe’s oldest bar and restaurant, El Farol is a perfect place for locals and tourists to gather for Spanish food, cocktails, music and entertainment. Nominated for the James Beard Best New Restaurant award, Eloisa Restaurant features modern southwest cuisine. Signature dishes include The O’Keeffe Table, a five-course tasting menu. Southwestern cuisine prepared with French techniques. Our ingredients are all locally sourced from Farmer’s Markets and area farms. Join us for lunch and dinner with renowned Southwestern Chef Estevan Garcia. Awarded 2015 Top 100 Restaurants in the Country by Opentable. New Mexico’s only Mobil 4-Star and AAA 4-Diamond restaurant. 26 years of fine dining in Santa Fe. We use organic and natural ingredients, local sourced pork, hormone & antibiotic-free meats. Homemade dumplings, shumai, Chinese tamales, farmer’s market bone broth! Authentic Chinese cuisine on the Plaza! Named after the resort’s benevolent ghost, the restaurant features innovative Southwestern and American cuisine. Extensive wine list. Patio seating. A lively European wine bar feel, featuring modern style Spanish tapas and extensive international wine list. Also offering seasonal patio, community table and music space in our Taberna dining room. The local’s choice for chile. Family owned, operated, award winning, New Mexican restaurant since 1983. Located by the Railyard park. Delicious margaritas, local beer, courtyard dining, pet friendly. Historic, romantic restaurant, encircled by hand-painted windows, beneath expansive skylights. Serving creative New Mexican cuisine on the historic Plaza. Authentic Mexican cuisine served in a beautiful space. Spend lunch and dinner on our pet friendly outdoor patio. Enjoy beer, wine, and margaritas with live local music in Burro Alley. Recognized by locals and visitors alike for its tranquil, inviting setting and inventive, globally inspired menu with a southwestern flair. A truly new experience for Santa Fe, Maize features creative cuisine based on local ingredients, Central and Latin American flavors. Full bar. Summer patio seating. Farm fresh sandwiches, salads and soups. Daily fresh baked goods. Coffee, Espresso drinks, Cold brew, Signature sipping chocolates and teas. Proudly serving Van Leeuwen Artisan Ice Cream. Free WiFi. Milad Bistro brings contemporary Persian cuisine to the Southwest. Traditional Persian dishes are counterbalanced with modern interpretations. The atmosphere is cozy, singular, and welcoming. Open Late. Southwest ambiance at its finest! The Ortiz Bar and Restaurant serving New Mexican influenced cuisine and refreshing handcrafted cocktails. Offering creative authentic Regional Italian cuisine by real Italians. We use the freshest local ingredients, extensive wines and cocktails, outdoor patio and gluten-free options. Private dining and banquet rooms. Authentic Italian Cuisine featuring artisan brick oven pizza, extensive wine list, house crafted smoked beers, pasta, salads and desserts. Home of the Chili Line Brewing Co. Open Nightly. At Radish & Rye, we offer simple yet innovative food and drinks sourced locally whenever possible. We are passionate about fresh food, and proud to support local farmers and ranchers. A casual atmosphere with creative artwork. The antique mesquite bar reflects Santa Fe from the early 1900’s. Contemporary American cuisine; with authentic New Mexican red and green chile dishes. Creative Southwest Cuisine and hand-crafted bar featuring Tequilas, Margaritas, 8 micro-brewed draft beers and 16 wines by the glass. Open Daily 11 am – 10 pm, Sunday brunch, patio dining. A local favorite for over 30 years. The exceptional Chef’s Buffet showcases delectable, healthful choices including daily hot entrée specials and soups. Serving breakfast, lunch, desserts, beer, and wine. New Mexican cooking since 1953. Local treasure located in a hacienda built in 1692. Santa Fe’s best red chile, native specialties and eclectic desserts. Outstanding margaritas, outdoor patio, pet friendly. New Mexico’s original sushi bar and local favorite since 1975. Full sushi bar featuring organic ingredients and the freshest fish. Wide-ranging sake list, Japanese craft beers. Open lunch and dinner. 60 E. San Francisco St. / 102 Water St.
Offering over 150 fine teas, coffee drinks and Mediterranean inspired food and wine. Fresh baked scones, muffins and desserts. Open daily 9 to 9 for breakfast, lunch and dinner. A casual, friendly and charming restaurant located in 100 year old adobe. Seasonal Contemporary American menu features light sharing plates and creative entrees. Try our extensive and affordable wine list. Enjoy our balcony overlooking the Plaza. Serving lunch and dinner from the southwest corner of the historic district. 100 + Tequilas, 20 tap beers, and 45 bottled choices. A genuine tradition for over 40 years. Serving award winning authentic New Mexico plates. Frozen margaritas, imported beers, and cozy full-service bar. Patio dining. Mon.-Sat. Rustic Italian cuisine prepared in an open kitchen. Eight handmade pastas nightly. Extensive wine list. Valet parking. Reservations recommended. For 33 years serving delicious grilled entrees, baked pizzas and wonderful Lounge favorites. Famous Piano Bar with dining & entertainment nightly. Located atop the Drury Plaza Hotel, Santa Fe’s newest rooftop bar with outdoor seating and the city’s best views! Specialty craft cocktails and weekday happy hours. French Roots, American Dreams. Visit our tasting room inside the Hotel St. Francis, learn about the Gruet family and sample award winning sparking and still wines produced in New Mexico. A local favorite, serving craft cocktails, beer on tap, and a creative menu. Patio seating. Valet parking. 219 W. San Francisco St. Highest awarded winery in New Mexico. Home of the chile wine. Offering daily tastings & locally crafted artisan cheese plates. Wine by the glass or bottle, in-house or to-go. 56 E. San Francisco St.
Santa Fe’s premier snack shop: Haagen-Dazs ice cream, gourmet coffee drinks, hot chocolate, homemade fudge, pastries, snacks and cold drinks. On the Plaza. Ecco provides authentic Italian gelato & sorbet, handmade daily on site! Ecco also serves hand pressed espresso, lattes, tea, scratch-made pastries, fresh sandwiches, salads, and more. Local favorite! ICONIK COFFEE ROASTERS 1600 Lena St.
ICONIK COFFEE ROASTERS – LUPE 314 S. Guadalupe St. Specialty coffee and tea, iced drinks, fresh pastries, bagels, breakfast, lunch & dinner! Many gluten free options. Come join the fun! Drawing on chocolate’s long history, let Kakawa Chocolate House re-introduce you to chocolate! Historic-based drinking elixirs, artisanal caramels, chocolates and amazing ice creams await you at our second location! The perfect sweet spot, this charming Café has espresso, art, ice cream, baked goods, Nitro coffee, & organic bubble teas & waffles. All inspired by a whimsical, playful vibe. Crafted in Brooklyn with fresh milk, cream, cane sugar, and egg yolks. Vegan options! Also serving carefully cultivated teas and micro-roasted coffee. Fresh and delightful treats baked daily. A tradition for over 40 years & winner of The Best of Santa Fe! Locally made chocolates with the finest ingredients. Including toffee, brittles, fudges, chile pistachio bark. Gift boxes. The Jewish Center offers community events, lectures, study and services. Stop in for a cup of coffee, a chat, a bite to eat, or to browse our Judaic gift shop. Buffalo Thunder Resort & Casino marries the raw, natural beauty of Santa Fe with the nonstop action and pure excitement of Las Vegas. Gaming action includes Slots, Poker, race book and the largest table games pit in Northern New Mexico! Santa Fe’s historic, hometown movie theatre, full bar, gallery, & bookstore owned by George R.R. Martin. Features independent and mainstream films, author events, magic shows & live music. Violet Crown offers a variety of programming options including independent and commercial films and features traditional theater concessions, chef prepared food and 30 rotating taps of beer, wine and cider. A Great American Artist, A Great American Story. Explore the career of Georgia O’Keeffe through her artwork, and the objects, places, and experiences that defined her life. Celebrating 19 years – elegance made easy! Daytime & evening dresses; tops, skirts, tummy tuck leggings & tunics. Confident, creative, classic. Most affordable prices downtown. 7 days. For 25 years, we have featured knitwear by Margaret O’Leary at near wholesale prices. We also have Indigenous Designs at great prices, organic cotton sportswear and alpaca sweaters made in Peru. Santa Fe’s finest leather shop featuring handmade boots, handbags, custom belts, jewelry & cashmeres. EUROPEAN DESIGNERS INCLUDE: Henry Beguelin, Officine Creative, Numero 10, N.D.C., Nigel Preston & Knight, handbags, footwear and apparel. Open Mon.-Sat., 10a-6p. Sun., 10a-5p. Since 1976, J. Boles Pena and Ceil Swanson Evans have created elegant handwoven apparel. Ruanas, wraps, and jackets complement separates in chenille, silks and linen. Local artists, jewelry, painted silk. Boutique with casual and artistic clothing for women. Lines include Yasuko Kurisaka, Habitat, & Cut-Loose. Owners travel to Asia to provide Kioti with handmade textiles and accessories. Santa Fe’s finest! Exquisite couture & western wear for men, women, children. Cowboy Boots, Belts, Buckles, Hats, contemporary & pawn Jewelry, hand-tooled/ hand-beaded Leathers. Home Furnishings, Art, historic Southwest Paintings. 123 W. San Francisco St.
Shop for Tommy Bahama, True Grit, Dylan, French Dressing, Ryan Michael, Pendleton, Scully, Brighton, Coreen Cordova Jewelry, Dorfman Pacific, UGG, Olukai, Rockport, Old Gringo, Born, Clark and much more. One of a kind, distinctive Women’s apparel and accessory collections that meld the artistry of textile design and contemporary fashion. 40 Years of Modern Artisanal Style since 1976. Designed and manufactured in the USA! Sense is all about bringing you multifunctional women’s clothing. Perfect travel wardrobe brought to you from our headquarters in downtown Santa Fe. Locally owned and lovingly operated in Santa Fe for 50 years! Current fashions for women of all ages. Designer brands, exquisite jewelry, accessories, purses, scarves, friendly, knowledgeable staff. Reasonable prices. Since 1984, Tom Taylor had offered the finest handmade-in-the-USA belts, buckles and bags for both men and women. Create your own personal style at Uli’s! Uli’s is a women’s, men’s, and children’s clothing boutique for people with discriminating and fanciful taste. We cater to all body types! Contemporary clothing for women! A favorite among locals and visitors. Celebrating 32 years with lines including Free People, Michael Stars, Velvet, Chan Luu, Joes Jeans and Frye boots. Since 1980, a clothing paradise for contemporary women of all ages. Featuring Eileen Fisher, Nic+Zoe, Comfy, Beyond Threads, Lisette & more! Unique jewelry, hats, scarves, handbags, and accessories. Vintage Hollywood Glamour, Vintage & Contemporary Designer clothing & Accessories. Eclectic Gold, Silver, Bakelite, & Costume jewelry. Two story building! The finest private label collection of hand-made and custom cowboy boots in the United States. Over seven hundred pairs of boots to choose from or design your own. Free Parking. Specializing in handmade cowboy boots for men & women, 250+ pairs in all sizes, styles & skins. Custom designs, made-to-order. One block South of the Plaza. Roy Flynn, proprietor. Since 1976, internationally recognized for quality Panama and fine fur felt hats, hand-finished to your specifications. Unique hatbands of gold, silver, precious, semi-precious stones, fine beadwork and braiding. An extension of Montecristi Custom Hat Works, SFHC offers carefully considered lines from Stetson, Milano, and Biltmore. For the ladies, top milliners include Patricia Underwood, Eric Javits, Helen Kaminski, and LDCarey. The nation’s leading gallery dealing in antique and contemporary Native American art, including plains Indian beadwork, historic Pueblo pottery, Navajo weavings, old pawn jewelry & museum quality Southwest baskets. T-shirts, sweatshirts, ball caps (adult & children’s) Santa Fe souvenirs, Native American crafted Folk Art, Jewelry and memorabilia. Local foods & spices. Great educational kids’ corner. Best prices on the Plaza. Exhibiting the finest Southwestern Native American pottery, handcrafted by 500 regional artists and specializing in the work of Maria Martinez. Our expert staff is dedicated to your educational retail experience. For nearly 70 years the Bahti family has presented fine Southwest Indian art. Hopi katsinas, Zuni fetishes and jewelry are a special focus. Mark and Emmi Whitehorse, proprietors. Native, old & contemporary, rugs, pots, textiles, jewelry – pawn & contemporary, Zuni fetishes, Folk Art, Mexican Collectibles, America Western Memorabilia, New Mexico Treasures. Two story building! Founded by teachers from Zuni Pueblo in 1981, Keshi is a direct outlet for more than 500 Zuni artists. Our reasonable prices and complete authenticity reflect this. Come see us! 215 E. De Vargas St.
Priceless treasures and the fascination of Indian country in “The Oldest House in Santa Fe.” Collection includes authentic Native American jewelry, arts & crafts, quality southwest gifts/ home accents. Huge inventory fine quality hand-selected traditional & contemporary Indian jewelry. Navajo, Zuni, Hopi, Taos & Santo Domingo & other regions. Fine fetishes, Pendleton blankets, drums, pottery, Kachinas. Over 38 years locally owned. The source for authentic, fine Native American art/jewelry. Largest collection amazing Zuni beadwork, Navajo folk art fetishes, handcrafted rawhide lampshades, drums, kachinas. Collectible Folk art by the renowned Ortega family woodcarvers: angels, birds, santos, and whimsical animals. Also, local kachinas, jewelry, pottery, children’s paint kits, plus more! Family owned business for over 30 years! Featuring Edward S. Curtis original photography. Vintage Native American & Mexican jewelry. Contemporary jewelry by Angie Owen, Jennifer Jesse Smith. Ron Archuleta Rodriguez Folk Art. Tom Russell paintings. Paseo Pottery is a working studio and gallery near the plaza. Our showroom features handcrafted dinnerware and one-of-a-kind pieces of ceramic art. 100% of profits are donated to local charities. Since 1971 featuring fine contemporary craft. Representing the works of accomplished masters in ceramics, wood, photography, painting & sculpture. Old Fiestaware & vintage ceramics. Two story building! Ancient to contemporary jewelry from around the world. Gold, silver, copper, Bakelite. Pawn jewelry, collectible, designer, & costume pieces. Two story building! Exclusive but friendly! Fine jewelry designed with rare and eclectic gemstones and pearls custom made for you. Representing the exceptional creations of a select group of artist/designers. For over 35 years, Gusterman’s has been designing and making inspired gold and silver jewelry featuring semi-precious stones and diamonds. 115 E. San Francisco St.
Santa Fe’s most unique shop. Locally owned and operated for over 30 years! Jewelry, Pottery, Kachina Dolls, Rugs and much more. Specializing in Native American Jewelry, Repair, and Custom Jewelry. Native American Artists: White Buffalo, Artie Yellowhorse, Arland Ben, Nestoria Coriz, & more. Local: Douglas Magnus, Dian Malouf, Scott Diffrient, Michelle Tapia & more. National: Gurhan, Armenta, Ippolita, Shinola. Visit our working studio showroom! We create fine contemporary jewelry with quality gemstones and high karat gold. Custom designs. Let Mario create a personal heirloom for you! On site repairs. Local legend since 1878. Celebrating the arts and artists that make Santa Fe unique. The best jewelry in the southwest, premium turquoise from boutique mines & collectable antique pawn jewelry. We carry fine Native American jewelry, for the past 25 years, we welcome you to our new location! Open year round. David Griego, Master Goldsmith, has been handcrafting southwest contemporary jewelry for over 40 years. Griego is renowned for gold and diamond rings inlaid with turquoise, Australian opal, and Mediterranean Coral. Welcome to Scarlett’s – a favorite shopping haven of locals and visitors. Featuring a beautiful array of high grade, authentic Indian jewelry by award-winning Zuni and Navajo artists. “Wear with everything!” designer necklaces by Santa Fe artist Penny Radenz. Wildly imaginative handcrafted Designer Jewelry by over 35 artists. Specializing in custom rings and commissions since 1974. Also featuring Ceramics of Tatiana and award-winning Fiber Art of Jennifer Day. A store you can trust with Packard’s roots! Featuring the finest in local contemporary and Native American jewelry, pottery, carvings and art. Museum quality designs you get to take home. Showroom, service center, purveyor of finest vintage, pre-owned and new timepieces; accessories. Restoration and repair for all high-grade Swiss watches by David Perlowin, second generation Swiss- certified watchmaker. Blending retail with resale. Affordable clothing & merchandise for everyone; serving the community since 1987. Providing cowboy boots, shoes, hats, accessories, maternity, toys, gifts, souvenirs, furniture, & equipment. Two story building! Santa Fe’s premier baby store! We have gathered handcrafted, artful gifts from artists in Europe, USA, and Santa Fe! Discover treasures for children up to age six. Moon Rabbit Toys inside the Plaza Mercado. Proudly selling products Made in the U.S.A and around the world. Puzzles! Stuffies! So many, many Games! And Toys! Toys! Toys! Santa Fe’s premier children’s store for over 30 years. Toys for all ages and specialty clothing. Tees, boots & moccasins. Games, puzzles, puppets, wooden toys. LEGOS, Playmobil, Calico Critters & more. 505-988-5792 or 125 E. Palace Ave.
One of the loveliest (and oldest) buildings in Santa Fe offering outstanding dining at La Casa Sena and Broadway entertainment at La Cantina. Unique shops and galleries. LUNA is Santa Fe’s most exciting walkable community. Located on historic Route 66 at the gateway to downtown, it is a locavore’s dream of shops, food, drink and coffee. 40 shops/galleries in an international marketplace. Sample Blue Corn Café’s own cerveza; take a class at Santa Fe Culinary Academy. Bring the kids to Moon Rabbit Toys. Visit 37 shops and galleries for the perfect dress, apparel, jewelry, fine art, personal care. Try a new take on pizza and brew at Rooftop Pizzeria & Marble Brewery. Year round. Visit one of the top ten Farmer’s Markets in the US. Check website for hours. Home to 22 shops and galleries. The shops, including Chuparosa and Crazy Fox live in the 100-year old building. Keshi – the Zuni Connection, resides next door. Next door to the State Capitol “The Roundhouse”. Feed your inner self at Rio Chama Steak House. Renew your outer self at Tiffany Nails & Hot Locks Hair Salon. 10am-4pm. #1 place for unique items direct from the artisans! Towa’s three independent nine-hole courses built in the Pojoaque Valley are equally challenging and extraordinarily beautiful – A Hale Irwin Masterpiece! Exquisite collection of Navajo weavings, vintage and contemporary. Colorful Zapotec rugs & pillows, custom sizes available. Edited collections of Balouch, Soumak rugs & more. “One of the world’s greatest shopping experiences.”- Conde Nast. The finest carpets, dhurries, Tibetan furniture, collectible kilims, solid teak doors, pillars, stone inlaid tables, marble sculpture & architectural artifacts. Vintage and contemporary Navajo weavings by well-known weavers such as the Littleben Family and Spider Rock Girls. 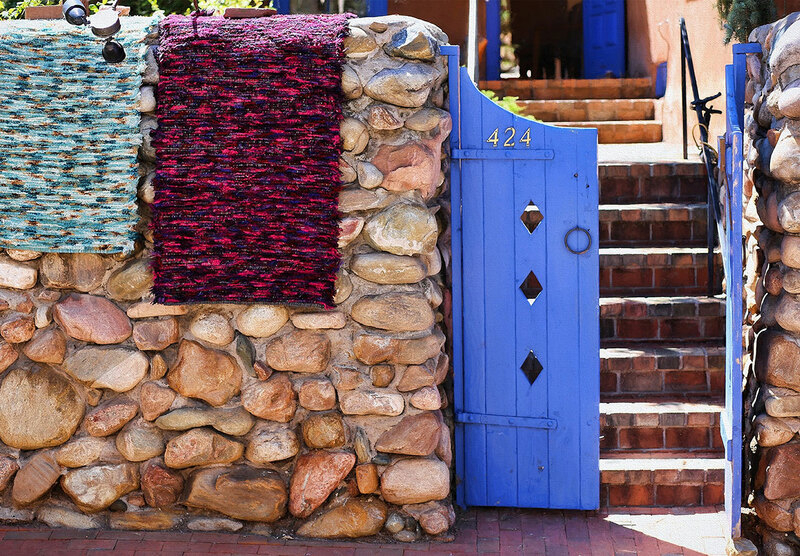 Featuring the finest selection of Zapotec pillows and weavings in Santa Fe! Member, Green Spa Network and one of Conde Nast Travelers’ Hottest New Spas in the World. Asian spa treatments, facials, therapeutic Thai & Hot Stone massage; luxurious Rose Petal baths. High Desert Healthcare & Massage is a wellness center dedicated to providing exceptional therapeutic massage, acupuncture and bodywork in a nurturing, friendly and professional environment since 1992. Recently named among the World’s 10 Best Spas by Premier Traveler Magazine. Enjoy relaxation and rejuvenation seven days a week. The award-winning Spa at Loretto takes a respectfully holistic approach to the art of massage therapy and well-being. USA Today #4 Best Hotel Spa and Conde Nast Top 25 Resort Spa. Full-Service spa and salon features expert treatments. Experience world-inspired spa therapies with indigenous healing elements to promote your serenity and health at the WO’ P’in Spa. ArtfulTea offers 80+ varieties of loose leaf tea, including classic or flavored black and green teas, oolongs, herbals and hand-blended organics – plus a range of fine teaware. Open daily. Featuring a thoughtful selection of hand-crafted, farm-based cheese, cured meats, antipasti, and grocery items like jams, chocolates, breads, & more, hand-selected from local and international makers. The Original Southwest Gourmet Shop! Only the finest foods including gourmet gift boxes. Beautiful wreaths, ristras, railroad china, pottery, cookbooks, handwoven table textiles and more. Catalogue & guaranteed shipping. Free daily tastings popular with locals & visitors at the Santa Fe Olive Oil & Balsamic Company specializing in aged balsamics & fine olive oils from around the world. The Santa Fe School of Cooking offers a variety of authentic cooking classes and events, including hands-on and demonstration style classes, restaurant walking tours and a regional market. Celebrating the foods of New Mexico for over 28 years! Locally owned/operated spice shop with over 400 products including 165 blends. We grind and blend fresh weekly and sell in jars and bulk. Cooking classes offered. Antique and contemporary furniture, leather goods, fine art, antiques, alluring accessories, eccentric tableware, floral designs, and custom jewelry – find unique gifts to be treasured for years to come! 109 E. San Francisco St.
Santa Fe’s original photo shop since 1937! Camera rental & repair, one hour photo finishing, digital cameras & enlargements, video products, accessories. Extensive products & services. Mon-Sat 9a.-6p. Sun 10a.-5p. Corner of Old Santa Fe Trail & San Francisco St. Unique gift gallery inside the historic La Fonda on the Plaza™. Features curated, one-of-a-kind merchandise drawn from travel, whimsy, discovery and local New Mexico artistry. 120 Don Gaspar - at Water St.
Offering happiness essentials™ since 1955! Discover hidden treasures filled with imagination, charm, whimsy and joy. Folk art, toys, books, cards and nostalgic keepsakes for the young and young-at-heart! 40+ years, one block off Santa Fe Plaza. Specializing in local gifts, food, spices and coffee. Authentic hand-crafted pottery. Fun kitchen gadgets and accessories. Locally owned for 40 years. Wide selection of Greeting Cards, Stationery, Gifts, Toys and Candy. Supporting local artist cards and gifts. Specialty services include custom printing and gift wrapping. Milagro Herbs has been providing Santa Fe with wild crafted and organic herbs, teas, tinctures, skin and hair care products and more for 21 years. Nambe Drugs is your neighborhood drugstore where personal service is the best medicine. We pride ourselves in getting to know you and understanding your needs. We compound and deliver. In Santa Fe since 1977, specializing in New Mexico crafted Christmas decorations and nativities, Department 56 Village collections, Polonaise glass and Jim Shore Christmas Collection. Shelby House, 220 Shelby St. Spirited Goods celebrates the cocktail hour & entertaining at home. 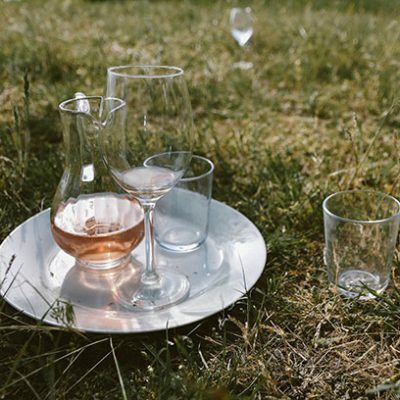 We specialize in distinctive new & vintage barware, tabletop & gifts for hosts. Parking behind shop. Featuring the Santa Fe Doggie Vestido™, innovative pet items, food, gifts, adoptions and events. Santa Fe’s Original T-shirt Shop! High quality art design tees – sweatshirts, hoodies, fleece jackets, caps and more active wear. Beautiful handmade chile wreaths and ristras. Locally crafted gifts. 54 E. San Francisco St.
A fun shop! Fine Native American jewelry and pottery, southwest books, cookbooks, children’s books and unique toys. Regional specialty foods, home kitchen accessories. Fantastic finds for kids and friends! Located in Santa Fe’s historic Plaza, we offer a wide variety of western and southwest designers, fine furnishings, art, and home decor items. Come by for an unforgettable shopping experience. Fine art, textiles, rugs, antiques, pottery & interiors from around the world. Tableware, glassware, linens & quilts. Two story building! Fine handcrafted reproduction furniture, decorative accessories, sophisticated country antiques and textiles from southern Europe. Exquisite hand-carved Spanish colonial reproductions. Peruvian custom furniture, frames, accessories. Stunning Talavera ceramics. Santa Fe’s premier luggage & travel store. All major brands, with over 400 different bags in stock + travel accessories. Open 7 days a week, 1 block N. of the Railyard. One-stop bead shop! Gemstone beads, pendants, glass, charms, leather cord, findings, seed beads, books, tools, gifts, cards and locally crafted jewelry. Free parking. Mon-Sat 10a-5:30p. 55 W. Marcy St. - corner of Washington Ave.
For 46 years, presenting an overwhelming selection of beads and supplies. Turquoise, silver, coral, heishi, gemstones, seed beads, Antique African trade beads. Re-stringing services available. Combining advanced medical eyecare with Santa Fe’s finest selection of luxury and artful eyeglasses. Four Doctors, two locations, one mission. Locally owned for two generations. “Best of Santa Fe” Winner. The world’s most exquisite and innovative designers are represented to create the most striking collection of sun and optical frames available. Specializing in sun and prescription-ready frames, with superior custom and Rx lenses. Reveal who you want to be with the perfect pair of designer eyewear! Optical frames and sunglasses include Sama, Dior, Celine and Lafont. Locally owned/operated. Flexible spending plans accepted. Time-lined fossils. Hundreds of minerals, bronzes & jewelry. Also a large sculpture garden property and “AMAZING GEMSTONE” wall art. 20 years of experience grooming Santa Fe’s prettiest pets. Conveniently located dog daycare. Walking distance from Santa Fe Plaza and pet friendly hotels. Please call for appointments or reservations. Since 2002 we’ve provided a “second chance” for over 4,000 cats and kittens who might not have otherwise found homes at animal shelters throughout New Mexico. Founded in Santa Fe, First National 1870 provides banking services including personal, small business, commercial, wealth management, and home loans. Our branch on the historic Plaza has easily accessible ATMs. In conjunction with Gerald Peters Gallery, the Southwest’s premier, full-service auction house. Carefully curated paintings, prints, works on paper & sculpture. Serving an international profile of buyers/sellers. 30+ years of providing premium boarding and daycare for cats and pocket pets in a quiet, home-like environment staffed by trained cat-lovers. Same day boarding available. The Mission of the Santa Fe Chamber is to strengthen the local economy and serve as the Voice of Business in community affairs. Buy it. Wrap it. Send it. Shipping, packaging, FedEx, USPS, UPS. Shipping supplies, greeting cards, gifts. Reserve a mailbox. 315 Alameda Blvd. NE, 505-247-2570. We’re a consumer-experience company for today’s connected world. We combine empathy, strategy, creativity, and technology to help businesses develop better products, websites, and marketing solutions to delight their users. Celebrating over two decades as New Mexico’s premier professional destination management company and receptive tour operator. The recognized industry leader for individually crafted full-service tours and corporate events. 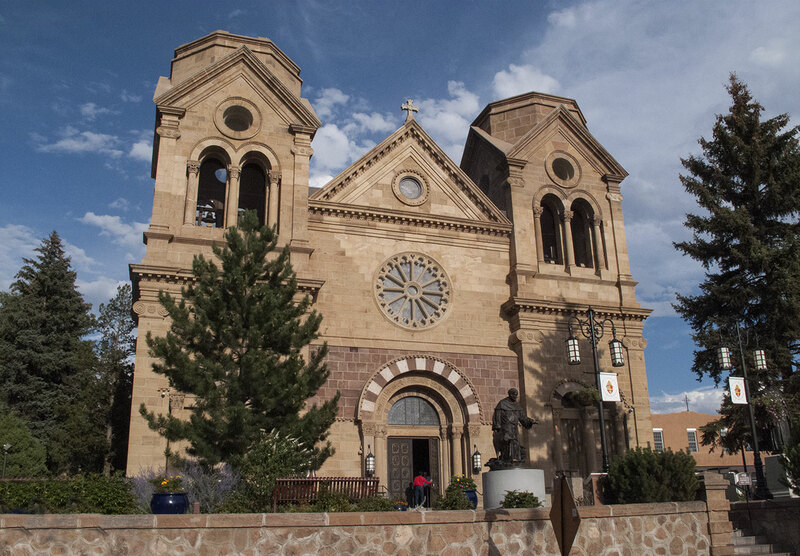 Featured on Good Morning America, daily Historic/Cultural tours of Santa Fe. Customized excursions to northern New Mexico. Popular Ghostwalkers Tour featured on Travel Channel – reservations please. The Original Santa Fe and Canyon Road Walking Map was created in 1975 by Jesse Taylor. His hand drawn buildings and images became a delight for visitors, who would discover new buildings and businesses with every return visit to Santa Fe. 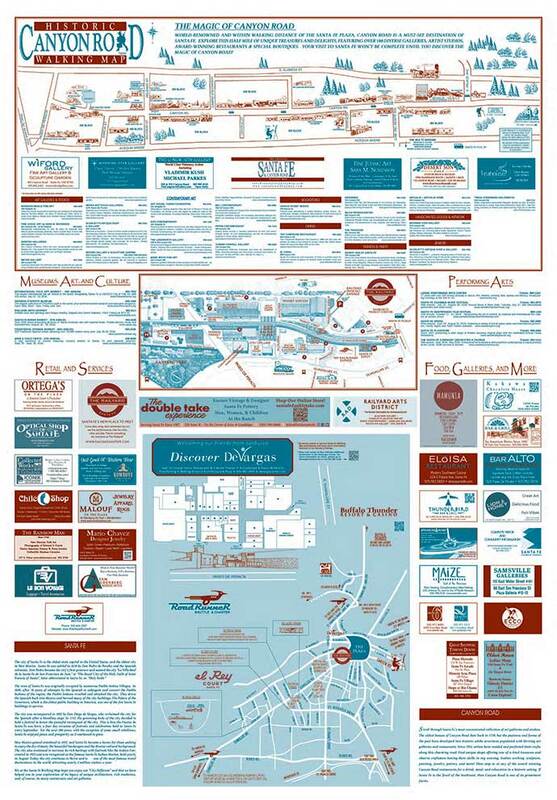 Over time, the map became a staple of the concierge and tourism industry in Santa Fe. Today, the Santa Fe Walking Map is used by over 300 hotels and businesses, and continues to be visitors’ first choice as a map and guide for the city. Please feel free to contact us if you need a map, or if you have any questions. We look forward to helping you Discover Santa Fe! Even though maps have become a cell-phone standard, the Santa Fe Walking Map still remains relevant and sought after. The map draws attention to businesses that may not show up on google maps, and allows visitors to find businesses they haven’t thought to search for online. It also works just fine in the sun or rain, doesn’t have to contend with screen glare, and won’t run out of batteries! A good travel guide or map does three things: It shows you where you want to go, lets you know how to get there, and introduces you to potential locations and attractions that you aren’t aware of yet. Our map has done this for over 40 years. Let us help you find your new favorite Santa Fe spot; and you can save the cell phone battery for when you get there. Our map is a one-page, double-sided, easily foldable walking map, meant to be tucked in a pocket or purse. These images will not print to size on a standard printer, so we do not offer a printable version. To order the map, please click “Order Maps” or feel free to call our office. To order more maps for your business, please click on “Order Maps” below, or feel free to call or email us. If you wish to order maps for your next visit to Santa Fe or for a tour group, please call or email us directly. Thank you! How many maps would you like delivered? Hotels and other high-volume businesses, specify how many boxes (200 maps per box) you need. Please note that delivery can take up to one week. We have several website advertising opportunities available, including banner advertisements, event promotion, and upgraded options for your listing. Please download the form below and call or email us with any questions you may have! 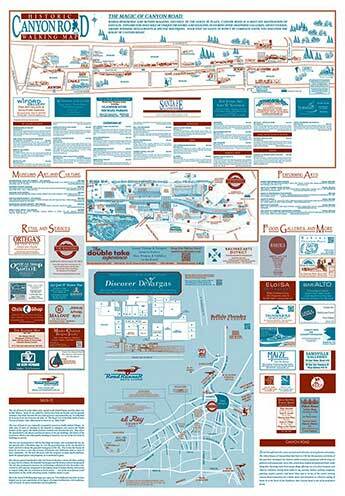 If you are a hotel looking to carry the Santa Fe Walking Map, please email or call us directly. 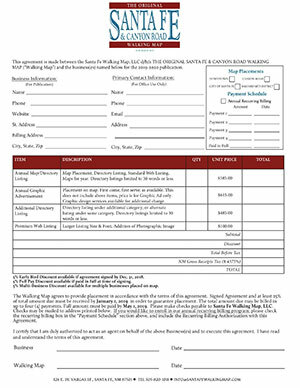 If you wish to list your business on the Santa Fe Walking Map, you may feel free to print out the agreement and email, fax, or mail it to us with either a check or one of our credit card authorization forms found under the tab at left. Please feel free to call us with any questions, or if you would like to discuss specific listing options for your business. We accept payment by check or credit card. 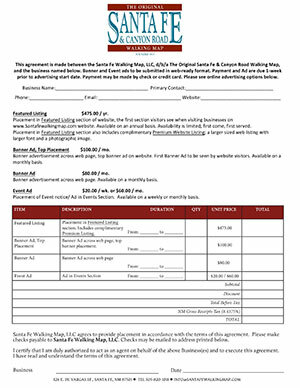 For our Annual Billing option, we can accept credit card or automatic bank draft. If you would prefer to make a one-time payment instead, please download the “Credit Card Authorization Form” and include it with your Annual Agreement. There are numerous opportunities for you to advertise with us! 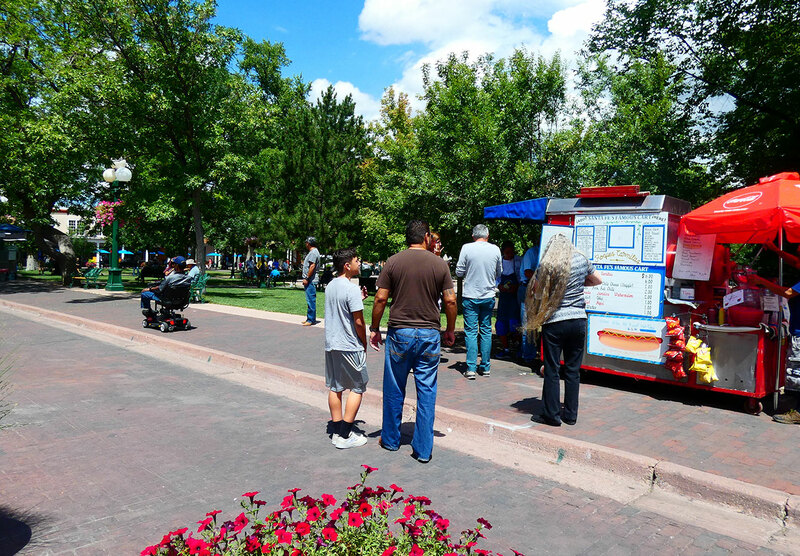 New businesses have seen a marked increase in clientele upon joining the Santa Fe Walking Map. 200,000 maps a year are distributed at over 300 locations, and we receive daily requests for maps via our website for those wishing to plan their trips to Santa Fe. Explore our physical map packages and variety of website advertising options to see what may work best for your business. We also have banner advertisements and event promotion spaces available. Please feel free to call or email us for more information! Lydia Griego-Hansen, Owner; Destination Southwest. We included a copy of the Santa Fe Walking Map in guests’ gift bags at our son’s wedding, and they were a big hit – so helpful to all our out-of-town guests! We had friends and family coming to town from all over the country, many of whom had never visited Santa Fe, so your map really helped them while exploring and shopping while they were here. Many thanks for your excellent maps!